Well it’s almost the weekend, but there’s certainly no rest for the wicked. With our brand new Birlea furniture arriving in the morning, and a full bedroom still awaiting a lick of paint – Kelly and I have definitely got our work cut out! 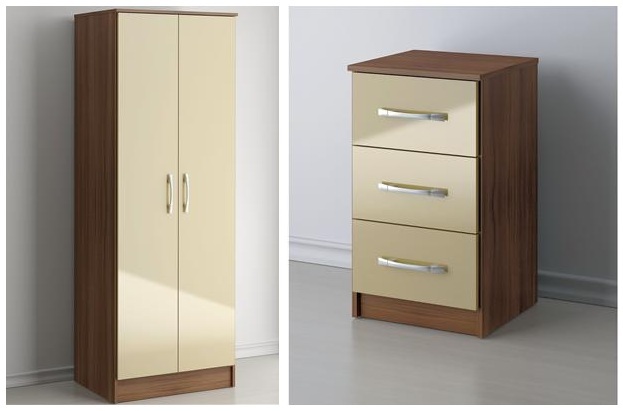 The furniture we have decided on is x2 Birlea Lynx two door wardrobes and x2 three drawer bedside cabinets, all with a beautiful clean cream finish to the doors and drawers. The Lynx Birlea wardrobe is available with a two drawer option but we weren’t so keen on losing out on the storage shelf above the hanging rail. Hopefully the instructions will be ‘reader friendly’. I love these companies that give you the option of having your desired furniture delivered fully assembled or in flat pack form, unfortunately I didn’t realise the option for fully assembled furniture was available at the time of purchase – luckily for me I was brought up with a screwdriver in my hand.